Because of all the craziness of this summer, I didn’t make Alex a birthday cake. Blasphemous, I know. His birthday was almost two months ago and I owe him a cake. Anyway, hours later he shows up at my door with the cake. Apparently he had been busy making the cake. His explanation was not enough for me. I didn’t eat the cake and I stayed angry for a couple more hours. (I can be quite dramatic.) As a result of that entire ordeal, Alex has never tried to make me a cake ever again. 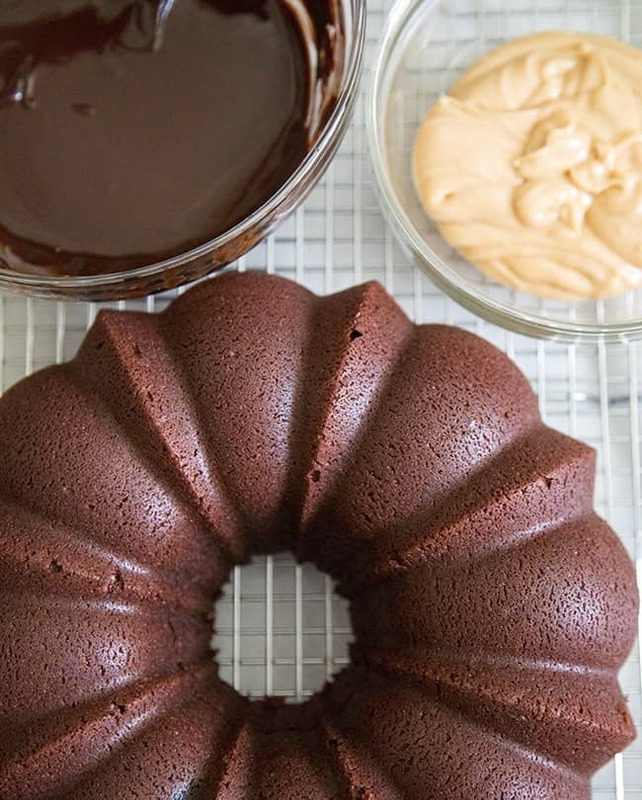 So back to this birthday cake… this peanut butter chocolate bundt cake is pretty amazing. 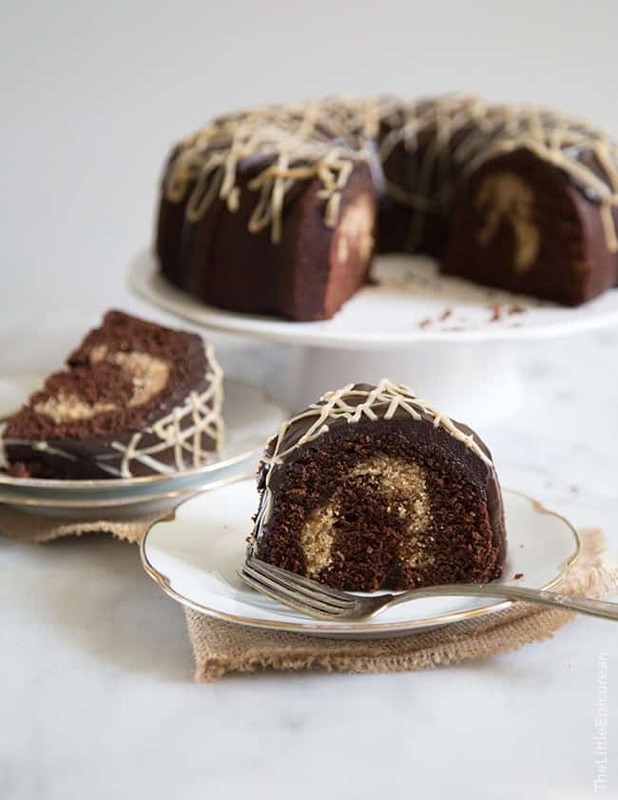 I adapted my old chocolate glazed whiskey bundt cake and added a surprise peanut butter swirl inside the cake. Peanut butter and chocolate is Alex’s favorite combination when it comes to desserts. I didn’t tell him what kind of cake this was when I presented it to him. It wasn’t until he saw the slice that he realized I included peanut butter. 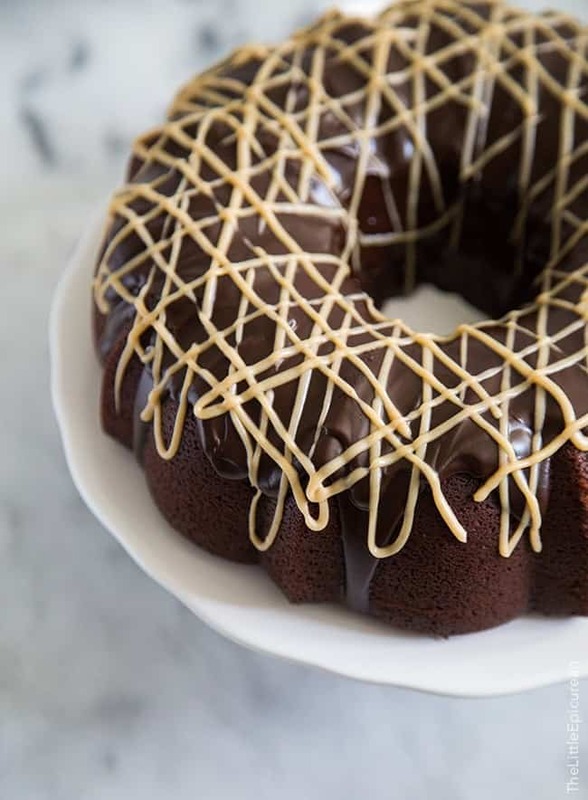 From the outside, it looks like a regular chocolate bundt cake, but inside there’s something special. I was inspired to make a bundt cake after seeing the latest issue of Martha Stewart Living. On the cover there is a beautifully sliced and styled coffee cake. The styling of my chocolate bundt cake is in homage that one. Alex loved his cake. He enjoyed a slice (maybe two) with a glass of ice cold milk. I promise next year I’ll be more timely with his birthday cake…but I think this peanut butter chocolate bundt cake was worth the wait. Preheat oven to 350 degrees F. Generously butter a 10-cup bundt pan and set aside. In a microwave safe bowl, heat unsweetened chocolate at half power at 30 second intervals. Stir often. Heat until chocolate is melted. Set aside. In a glass measuring cup, stir together instant espresso powder and cocoa powder. Add enough hot water until liquid mixture measures 1 cup. Stir until powders are dissolved. Add milk and let cool. In the bowl of a stand mixer with a paddle attachment, cream butter and sugar until light and fluffy. Add eggs one at a time, making sure egg is incorporated before adding the next. Scrape down bowl as needed. Add slightly cooled melted chocolate. Continue to mix on low-medium speed until combined. In a medium bowl, whisk together flour, baking soda, and salt. With the mixer on low, add 1/3 of milk mixture, then 1/2 of flour mixture. Repeat, ending with the milk mixture. Mix until combined. In a medium bowl, cream together butter and peanut butter until smooth. Add sugar and mix until combined. Add half of the beaten egg. Discard other half of egg. Mix until combined. Fold in flour and salt. Add milk and stir to combine. Mix until flour is incorporated. Add half of chocolate batter to prepared bundt pan. Distribute peanut butter cake filling on top of chocolate layer. Swirl with knife to spread out peanut butter batter. Add remaining chocolate batter to cover peanut butter batter. Bake for 50-60 minutes, until toothpick inserted in cake comes out clean. Let cool in pan for a couple of minutes before unmolding. Let cool to room temperature of wire rack. Over a double boiled, melt together chocolate and butter until smooth. Alternatively, you can microwave it at half power at 30 second intervals until melted. Remove from heat and whisk in glucose. 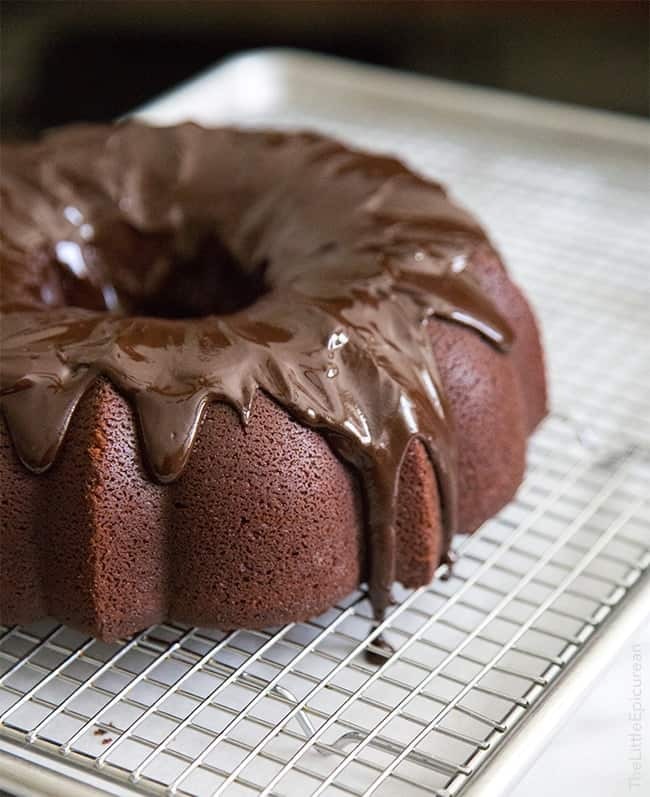 Pour over cooled bundt cake. Stir together sifted powdered sugar, peanut butter, and salt. Add milk and stir until smooth. Add additional milk if glaze is too dry. If glaze is too thick, add additional sifted powdered sugar. 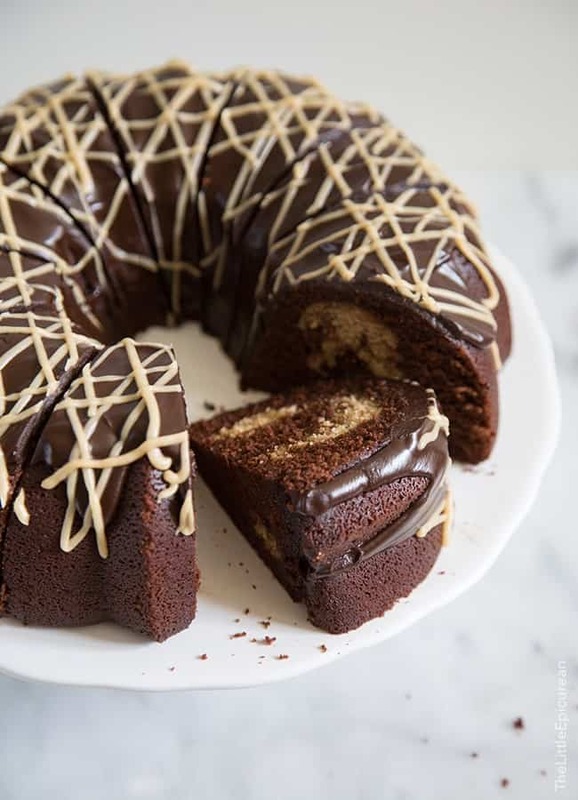 Drizzle peanut butter glaze over chocolate glazed bundt cake. Note: The peanut butter cake filling is not creamy. It will be more cake-like in texture. Chocolate + PB. I’m so there! Your cake looks fabulous! This cake has me drooling already. Brilliant idea to make the pb filling a cake filling. Where did you get this recipe or did you think of it? 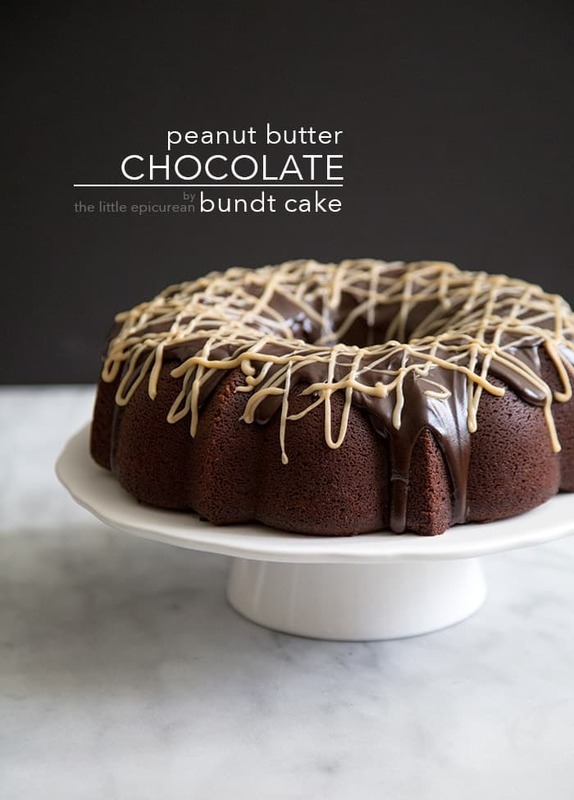 loving the look & sound of a peanut butter chocolate bundt! definitely craving a slice, pinned! I can’t wait to make this cake. It looks amazing. Also love the story!!! I should not have read this at 9am. Now I want cake. For breakfast. Pinning this beauty! Yay, can’t wait to meet you in NYC! 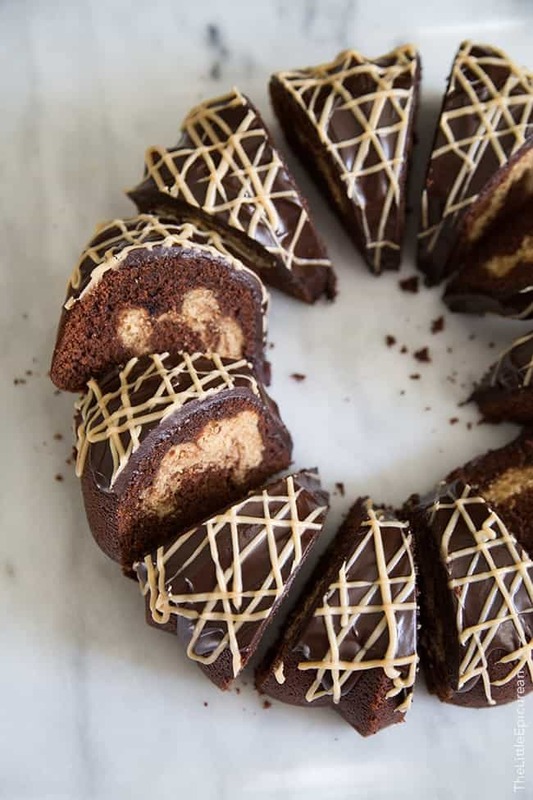 Peanut butter swirl in a chocolate bundt cake is pure genius! Drooling uncontrollably, here. Can’t wait to give this recipe a try! Hi I made your cake last night and it looked so great. The chocolate part was great. It was moist and fluffy. On the other hand the peanut butter swirl was not so much I don’t know where it went wrong. From the picture I thought it would be creamy, but instead it was very thick or eggy like. Next time i’ll try putting baking powder in the peanut butter and hopefully it would be as fluffy as the cake. Hi Hope, thanks for trying out the recipe! The peanut butter swirl isn’t creamy. It’s supposed to be a peanut butter cake inside the chocolate cake. 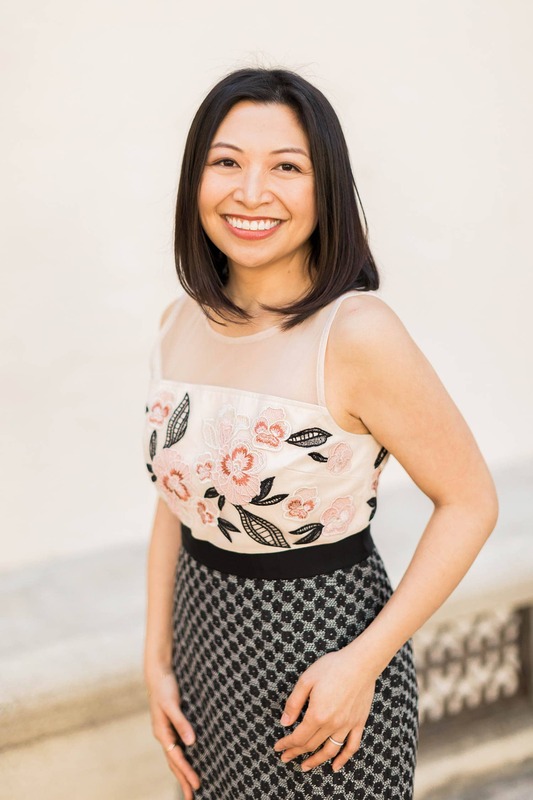 Hi Rebecca! Sorry, I’m not sure how coconut milk and oil would work in the recipe. However, I’d love to hear about it if you try it out! I’m a little late to the party, but I wanted to let you know that I made the bundt cake for my wife’s birthday and it was a hit. I was told that I screwed up big time, as I will have to make this every year for her birthday. Thanks Maryanne! That’s wonderful to hear! Thanks so much La Shawn!! attempted to bake this now twice to disastrous results both times. Cake has come out dense and pastry both times. I thought this was a result of over beating so in lieu using the stand mixer I hand mixed it the second time and it was still a disaster. Not sure where this goes wrong but it’s really a shame. Hi Matt, I’m sorry to hear that. I’ve made this recipe several times with consistent results. Perhaps the unsweetened chocolate was burned during melting. If the chocolate is heated out of temper, it will become grainy. What happens if I were to omit the espresso?? The espresso powder highlights the chocolate flavors. You can easily omit it, if you’d like. When do you add the cocoa a SN espresso milk mixture? Step 6 in the directions.